The EE Group Provides innovative Paging Data Products at competitive prices. See them all HERE. 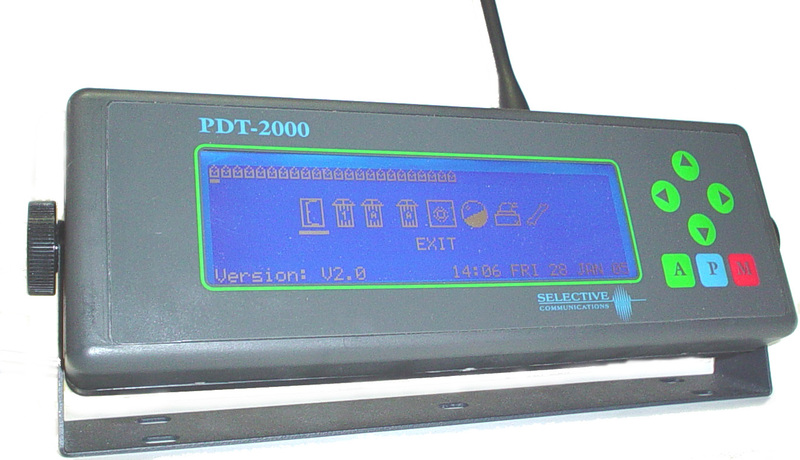 The PDT2000 Paging Data Terminal is a multi-function paging device capable of receiving messages and displaying them on a large (130 x 40mm) graphical LCD display. It is also able to print messages direct to a parallel printer or output the message data via 1 or 2 serial ports. The PDT may also be fitted with up to four relay control outputs internally or may interface with the RCM2000 Relay Control Module for multiple relay control. Other options include an inbuilt pocsag paging encoder for repeater or rebroadcast applications and other specialized serial data inputs and outputs for control of devices such as LED signs. The PDT2000 is also available in a ruggedized version for harsh environments such as mounting on forklifts for in-plant messaging and dispatch. This unit is perfect for medial emergency (Code Team) notification, use in the PBX to insure that the information goes out properly, record the message/ date/ timestamp, etc. for verification and risk management. Picture of a PDT2000 mounted in a command vehicle of the Bureau of Emergency Services & Telecommunications. PDR2000 Paging Data Receiver The PDR2000 Paging Data Receiver is a multi-function paging data receiver capable of receiving paged messages and processing them in a variety of ways. In Medical Emergency providers we use it for verification of system integrity by providing a constant 24/7 test-and-alarm of your paging system infrastructure. The PDR watches the encoder, link and transmission network and if it fails to operate within minutes the PDR alarms to notify you of the failure. This allows you to be pro-active and immediately locate the problem and commence resolution instead of simply waiting for users to complain of missed pages. It is able to print messages direct to a parallel printer or output the message data via the serial ports in a number of different formats and protocols. The PDR2000 may also be fitted with up to four relay control outputs internally or may interface with the RCM2000 Relay Control Module for multiple relay control. Other options include an inbuilt pocsag paging encoder for repeater or rebroadcast applications and other specialized serial data inputs and outputs for control of devices such as LED signs. The PDR also has an inbuilt search and replace text facility for manipulating the incoming messages. We have developed a wide range of applications that use the considerable functionality of the PDR2000 so if your requirement does not appear on this page please contact us to discuss your requirements.